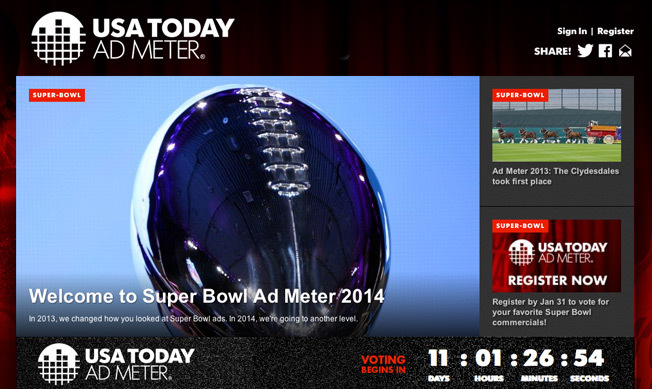 USA Today is expanding its Super Bowl Ad Meter program this year, adding a layer of analysis to show how well the high-stakes ads performed by audience segment. Last year, the Ad Meter opened up voting to the public, replacing its years-old system of using a hand-picked panel of judges. Some 13,000 viewers signed up, about 10,000 of whom cast votes. This year, the results from that wider voting pool will be sliced and diced by characteristics including gender, age, geography and household income. USA Today is partnering with Adobe to provide the analysis. USA Today created the Ad Meter in 1989 to gauge consumers’ responses to TV’s most expensive ads. Because of the nature of the voting, the Ad Meter had its limits; when voting was opened up to the public, the results became more mass-market. But voting was still limited to people who took the time to sign up online, and the results said little about why a given ad performed well or not. This year, the analysis provided by Adobe will better inform the paper’s reporting on the ads’ results and provide actionable information to Super Bowl advertisers who are hungry for feedback on how their spots performed, said Larry Kramer, president and publisher of the Gannett-owned paper. Like last year, voters will weigh in at USA Today’s password-protected Ad Meter hub for all ads that air from the coin toss to the end of the game, including those that air during halftime. The winning ad will be revealed shortly after the game ends Feb. 2, and complete results and rankings will appear online and in USA Today's print edition Feb. 3.